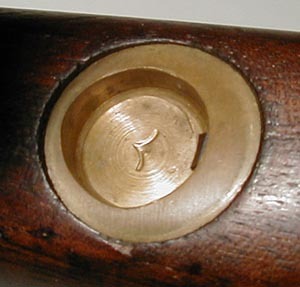 The British War Department's Acceptance, or "Finished View Mark" is one of the most commonly seen marks on a military Martini-Henry. This mark was applied to a part of the weapon when it passed all inspections, and was accepted for service. It was typically the last mark applied to a part. There are two variations of the War Department's Finished View Mark. The primary difference is in the broad arrow itself. This example, with the fat lines and flares, is a London area mark, as it was applied in the London proof area. This straight and symmetrical broad arrow in this example is from the Birmingham proof area. Sometimes, this mark is seen in an abbreviated form as only the broad arrow. 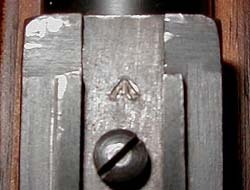 This example is on the rear sight bed of a Martini-Henry Mark III Infantry Rifle. Another example of the abbreviated War Department Finished View Mark. A Birmingham area War Department Finished View Mark on the tumbler of a Martini-Henry. 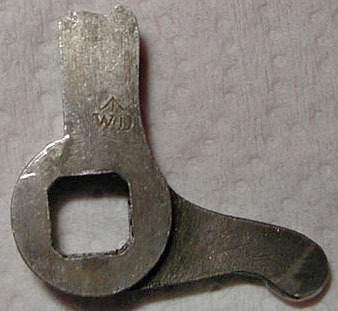 A London area type broad arrow in the middle of the operating lever retaining cup.